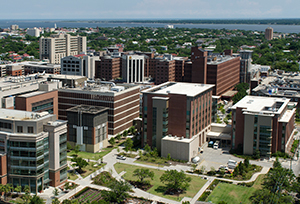 MUSC Health is ranked in the top 25 institutions for cancer care by U.S. News & World Report's 2018-19 edition of "Best Hospitals." A special ceremony allowed this couple to cherish their final moments together. Says one oncology nurse who was part of making the magic happen: “Moments like this not only make you a better health care provider, they make you a better human being. Volunteer shows cancer patients and caregivers how to tap into healing powers of art. Not one size fits all, and nowhere does that show up more than in the recruitment of racial and ethnic minorities into clinical trials, says Hollings Cancer Center researcher Marvella Ford, Ph.D.
Hollings Cancer Center bears stamp of Senator Hollings' amazing legacy. 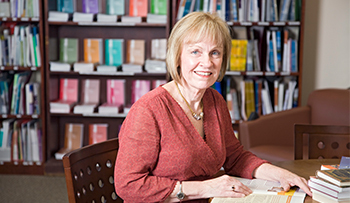 Study calculates costs associated with smoking by patients with cancer. Behind every patient stands a multidisciplinary team of cancer specialists who work together to determine the best care plan for each patient, and across our campus leading scientists and researchers work daily to unlock the clues to cancer. 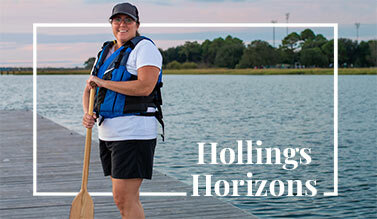 Published twice a year, Hollings Horizons magazine captures the transformational developments happening at Hollings Cancer Center. You will find the inspiring stories of many patients and the behind-the-scenes stories of our staff and leadership. The fourth annual "One-in-Three Afternoon Tea" Linda Floyd Forum on Women's Cancers is right around the corner on May 1. 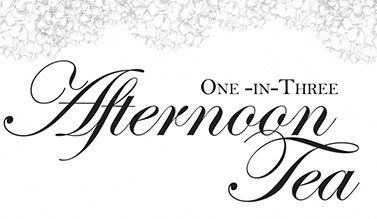 Join us for afternoon tea, an occasion to share, learn, and engage in dialogue with experts from Hollings Cancer Center. This year, more breakthroughs will be discovered. More cancer patients will find hope. 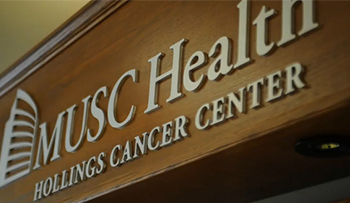 And Hollings Cancer Center will be on the leading edge of offering better options to patients. 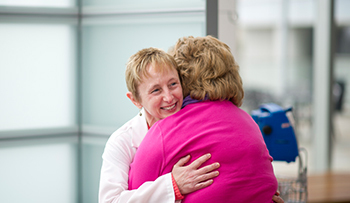 As a cancer center that combines patient care and research, Hollings brings together over 120 physicians and scientists who are driving the discoveries that will lead to tomorrow’s treatments. The only National Cancer Institute-Designated Cancer Center in South Carolina, Hollings is at the forefront of cancer research. This research is the driving force behind delivering medical advances to patients and their families, enabling us to educate health care professionals and the public, and to establish outreach services for underserved populations. 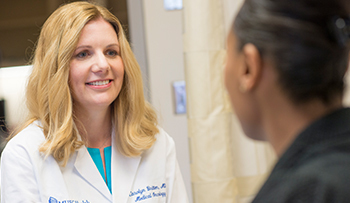 "We are so fortunate to have a cancer center offering groundbreaking research and top-notch patient care right here in South Carolina"
Bobbi Conner talks with Dr. Jennifer Harper about a fitness and wellness program for breast cancer survivors. "Changing Trends in HIV: Metabolic Co-Morbidities in the Modern ART Era"
As one of the leading cancer treatment centers in the Southeast, Hollings Cancer Center combines the full range of cancer specialties to deliver a higher level of care to the patients we serve. Our team of more than 60 sub-specialists – each concentrating on a specific discipline of cancer treatment and care – works with individual patients to develop customized treatment programs that target a broad range of conditions. Our specialists work together as a team, often meeting with patients under the same roof on the same day. We are striving to deliver the highest level of care in the best way possible. The heart of our patient care is located in downtown Charleston, SC. Patients may also be seen in oncology clinic locations closer to home. Personalized patient care is at the center of everything we do. And no one tells the story better than our patients themselves. 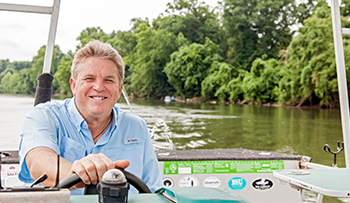 Meet some of our patients and hear about their cancer journey. Patients may be referred to Hollings by calling MEDULINE at 843-792-2200 or 800-922-5250, MUSC’s dedicated consultation line open 24/7 exclusively for health care professionals or through the online Patient Referral Portal. Hollings offers resources for patients, families and those interested in learning more about cancer prevention and risk. These include our Patient & Family Resource Room, the online MUSC Health Library and many services and support networks. Every treatment that has ever made a difference in cancer was once a part of a clinical trial. The Hollings Cancer Center is committed to offering the best treatments available today while searching for even better ones for the future. 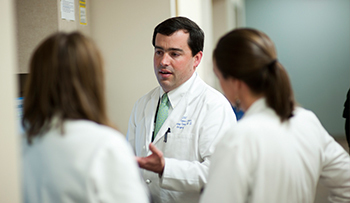 As an NCI-Designated Cancer Center, Hollings Cancer Center is part of a national network of clinical trials, with access to hundreds of trials across the United States.